There's a smaller battle waging within the never-ending smartphone wars that Samsung has managed to heat up: mobile payments. The Korean mega tech firm has released Samsung Pay, its answer to Apple Pay and Android Pay. But what does it offer that's different, and are you able to use it? In some markets, Samsung Pay has a serious leg up on the competition through some clever tech and fruitful partnerships. Here's everything you need to know about Samsung Pay. Samsung Pay initially launched in South Korea in August 2015 before launching in the US a few weeks later. Those in Australia saw the release in June 2016. After a long delay, it's now coming out in the UK. Samsung hasn't explained the delay in the launch of the service, but you'll be able to use Samsung Pay from May 16, 2017. Does my bank support Samsung Pay? Whether you can use Samsung Pay depends on what banking service you use. 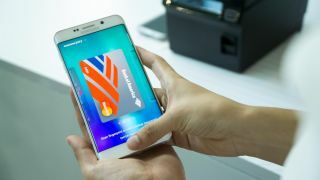 Services in the US that allow you to use Samsung Pay include Chase, American Express, Bank of America, Wells Fargo, Citi, Capital One, US Bank, PNC, USAA, TD Bank, Synchrony Bank, SunTrust, Navy Federal Credit Union, Regions, BB&T, Fifth Third Bank and BBVA Compass. To check your US service is included with Samsung Pay, you can check the official list from Samsung. If you live in the UK, the service is a little more limited with only Santander, Nationwide and MBNA currently supporting Samsung Pay - and HSBC, First Direct and M&S Bank have been added to the roster as well. Soon Samsung hopes American Express to soon use the service too, although we still don't have a date on that just yet. If your bank isn't listed here, you may find you're able to use Android Pay to get mobile payments on your phone. Meanwhile, those in Australia will need to bank with WestPac, American Express or Citi to be able to use Samsung Pay. What phone do you need to use Samsung Pay? In the US, Australia and UK you can use Samsung Pay on the Galaxy S8, Galaxy S8 Plus, Galaxy S7, Galaxy S7 Edge, Galaxy S6 and Galaxy S6 Edge, but those with older devices will likely have to download a software upgrade to be able to download the Samsung Pay app. You can get Samsung Pay by downloading the app on the Google Play Store - it won't just appear on your phone if you have an older Samsung device. Those in the US and Australia with a Galaxy A5, Galaxy A7 or Galaxy Note 5 will also be able to use the service and we expect it to come to those devices for those in the UK soon. To use Samsung Pay, all you'll have to do is register your credit cards of choice and start tapping at any point of sale (PoS) machine that accepts credit cards. Yes, this means that Samsung Pay will work even if the PoS does not have NFC (or near-field communication) technology built-in. How? It's done through MST, or Magnetic Secure Transmission. The special MST antenna, all of the above Samsung phones can trick standard magnetic strip credit card readers into registering a tap as if you had swiped your plastic. It does this through generating changing magnetic fields over a very short period of time - think fractions of a second - emulating the data-filled magnetism that a standard credit card swipe would. That's only the case for those in Australia and the US though, the MST element of the service is not coming to the UK. Samsung claims there are enough contactless terminals in the UK that it doesn't think it's worthwhile including the MST feature. Considering MST is the biggest unique selling point of Samsung Pay, there isn't much reason to use this over Android Pay in the UK. Samsung's Global Co-GM of Samsung Pay Thomas Ko was keen to reassure TechRadar that these antennas are neatly placed away from all other radios within its phones to avoid interference that might otherwise create security holes. Speaking further to security, Ko went on to assure that all of the data transmitted in a given transaction is encrypted using a one-time token system. Each time a transaction is executed, the phone supplies a unique, ephemeral token to the terminal. When it then arrives at the associated banking institution's firewalled servers, the token is then decrypted and processed. Ko told TechRadar that Samsung is actively working on expanding this feature to work with other institutions, like Chase, Discover and more. Samsung Pay also supports gift cards and store-branded credit cards through the exact same method, not to mention NFC.